Title text: Cauchy-Lorentz: "Something alarmingly mathematical is happening, and you should probably pause to Google my name and check what field I originally worked in." The text accompanying the piecewise plot is missing an ending quotation mark. What Randall doesn't know is that actually those dots are all points on a Radar Plot. Something to do with responses to Rorschach tests, I think. Soupspoon wrote: What Randall doesn't know is that actually those dots are all points on a Radar Plot. Something to do with responses to Rorschach tests, I think. 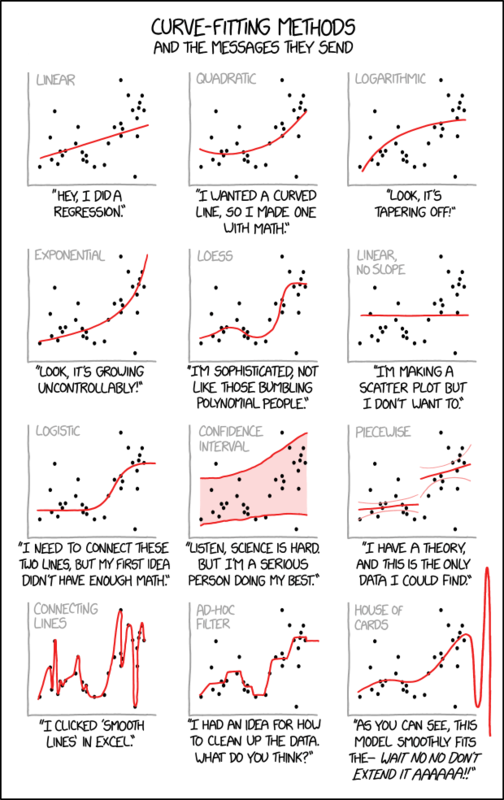 Reminds me a bit of the "Datasaurus Dozen" graphs. Is there a trick to the hidden text punchline? Lorentz was in theoretical physics, especially electromagnetism. Cauchy was a civil engineer working on a canal for Napoleon. Neither seem especially disreputable. It's not a joke about the dudes, it's about their probability distribution, which is in many ways "pathological" as a distribution, though I don't know how often it's used to fit curves. Ah, the eternal source of statistics jokes. An image search brings up plenty more opportunities for suspicious fitting - B-spline, devil's curve (if you can present your data in polar) - and the occasional guide on how to dress for one's body shape. I'm loving Sableagle's interpretation of the datas. The "house of cards" diagram reminds me of when I first learned about polynomial interpolation. Despite some occasional overshooting they result in nice smooth motion ...until you try and see what prediction power it has and *BLAM* everything explodes. But what message do the polynominal people send? This is why I just use a regression where appropriate, multivariate if there's sufficient data, and call it a day. Anything more is the mathematical equivalent of sophistry. Mjb wrote: Ah, the eternal source of statistics jokes. I love how the Teacher's T distribution kinda looks like Barad-dûr. The key to curve fitting is to ask the question "how necessary is the complication of this particular equation when I remove some data. That shows how robust the curve fit is. This can be taken to the limit of removing all the data; the resulting curve should be perfect. ..mmmpphhh guess you'll have to look back to see the image I tried to quote. It could be (and often is, these days) a lot worse: just imagine what the results would be if you tried to apply machine-learning to distinguish among those groupings. LucasBrown wrote: Comic strip and alt-text. I have done all of these. But not to the same data. It's a bit of an ambiguous pronoun, but I think it's supposed to mean that you'd want to Google the credentials of whoever is using the Cauchy-Lorentz distribution in a statistical analysis, rather than Cauchy and Lorentz themselves. Because if you're trying to use that distribution in an actual applied setting, you're probably either doing something very clever, or very wrong. Reason: The reported message has the only purpose to advertise for a website or another product. If you’re a bot, posting the last rejection is a giveaway. If you’re not a bot.... you kinda look like a bot right now.. I posted a link to a similar plot from the journal Science. If this was handled by a human moderator, it should have been clear from the link that it was unlikely to be an ad. A human might actually have looked at the link and been able to make a rational decision. So presumably this was addressed by AI, with only the A being appropriate. PS I am not even that sure of what a bot is, much less spend my time studying their behavior. The Goddamn Rules wrote: 3. You cannot post any links before you have reached five posts.